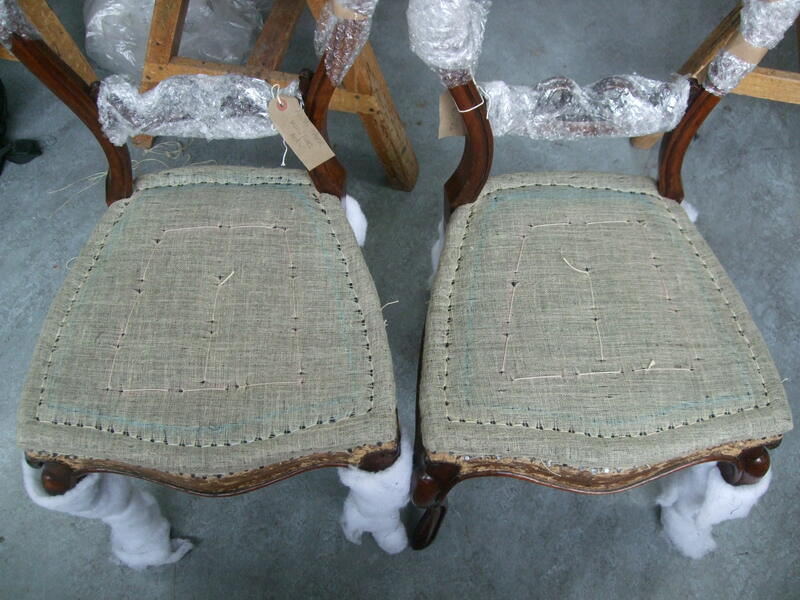 A lovely customer recently asked me to reupholster four dining chairs for her. She had inherited them from her parents who had been given them by their neighbour – Aunty Win. 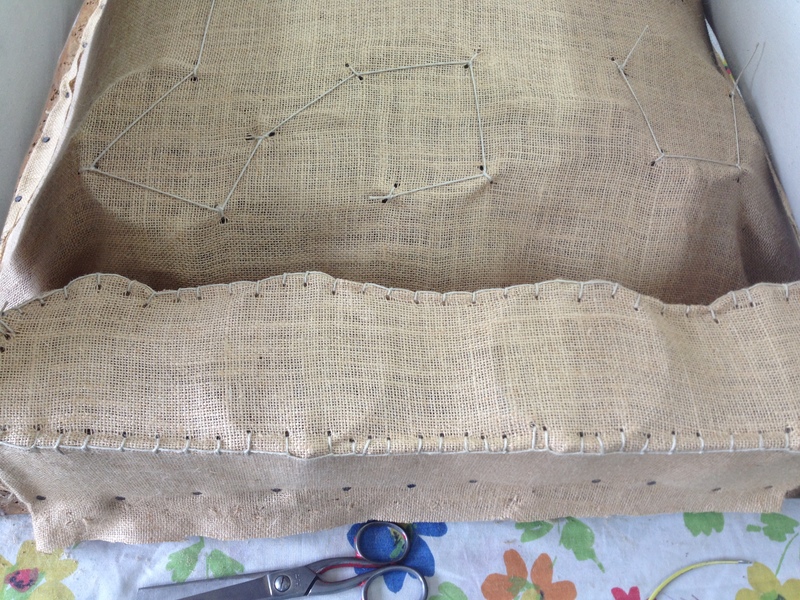 The fabric reminded me of the carpet bag that Mary Poppins pulled a standard lamp out of…. Anyway, I digress! 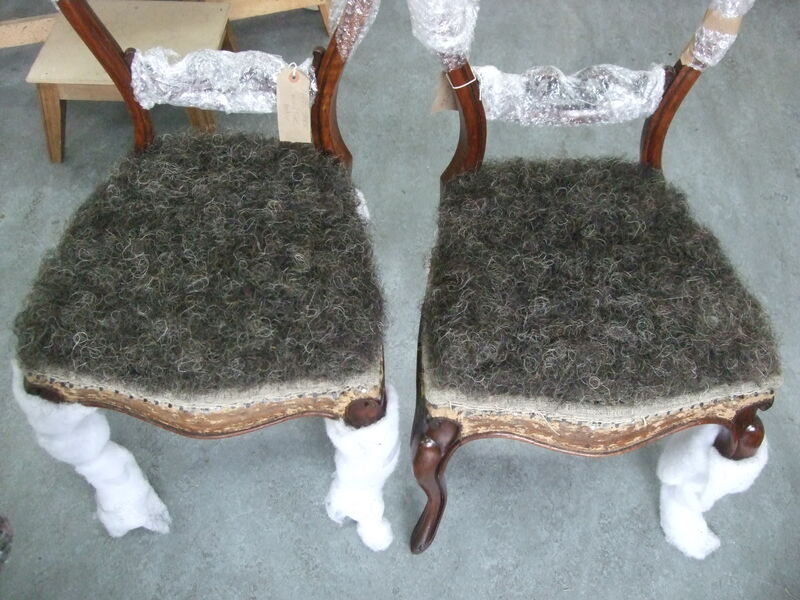 They were lovely solid frames but they needed new seats. 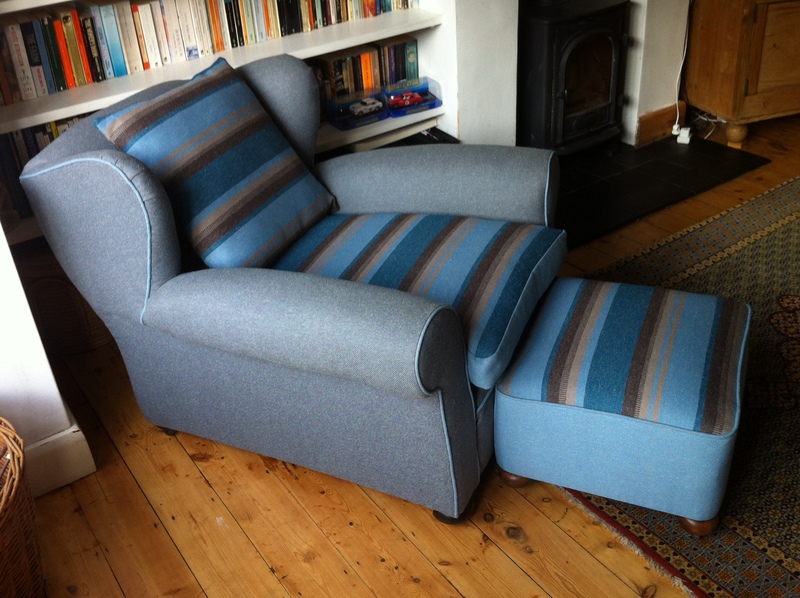 After the second stuffing and calico, I really enjoyed using the beautiful Welsh wool fabric that my client had chosen. 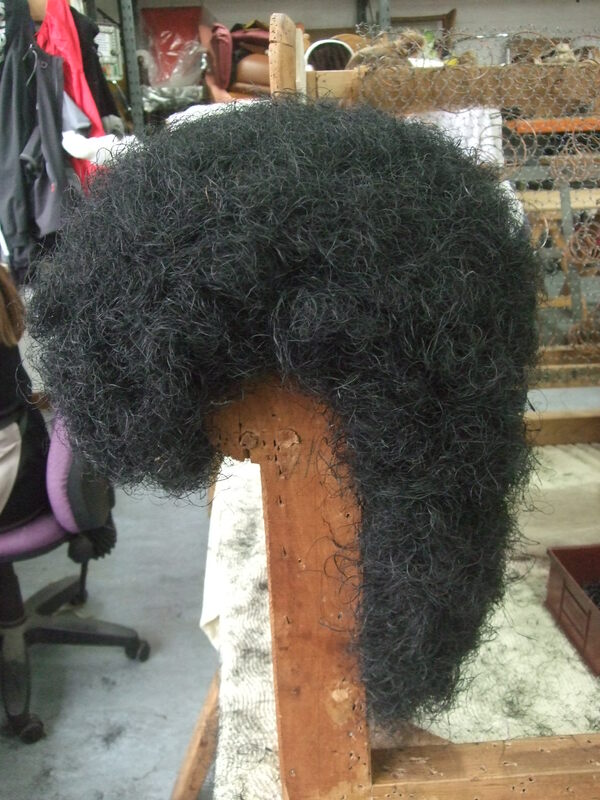 Its made by Melin Tregwynt Wool Mill in Pembrokeshire. 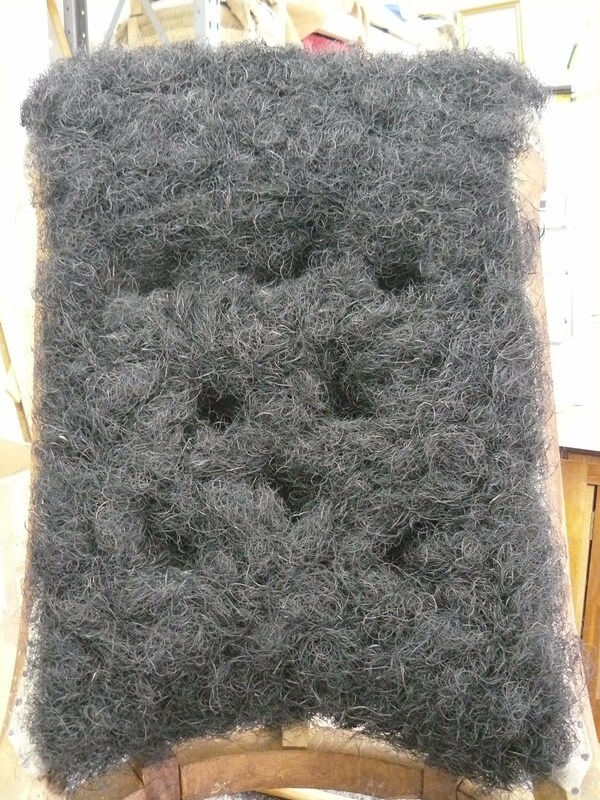 Now, I really want to make my own carpet bag with that old fabric…..
Posted in upholstery and tagged carpet bag, dining chairs, fabric, Traditional upholstery, upholstery, Welsh wool, wool on 17/10/2018 by Spring Upholstery. 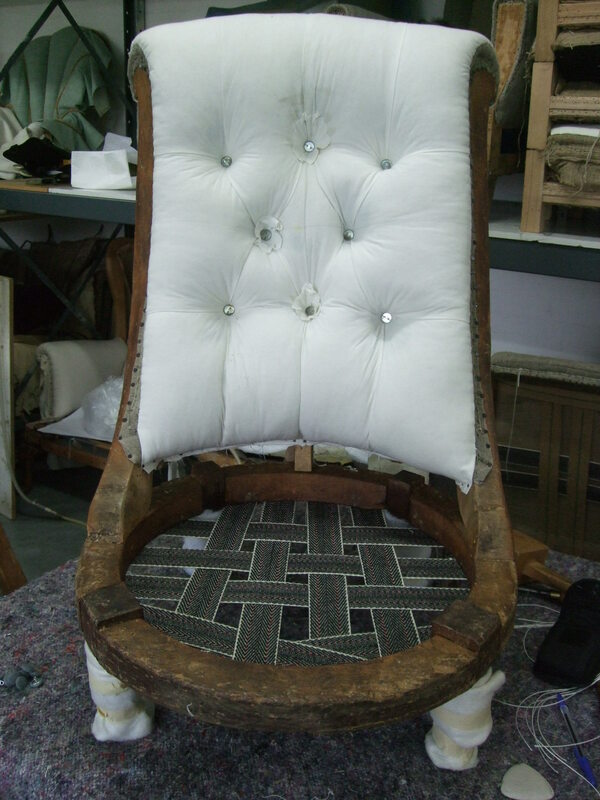 I’ve been meaning to write a blog about this beautiful old French nursing chair for a while now. 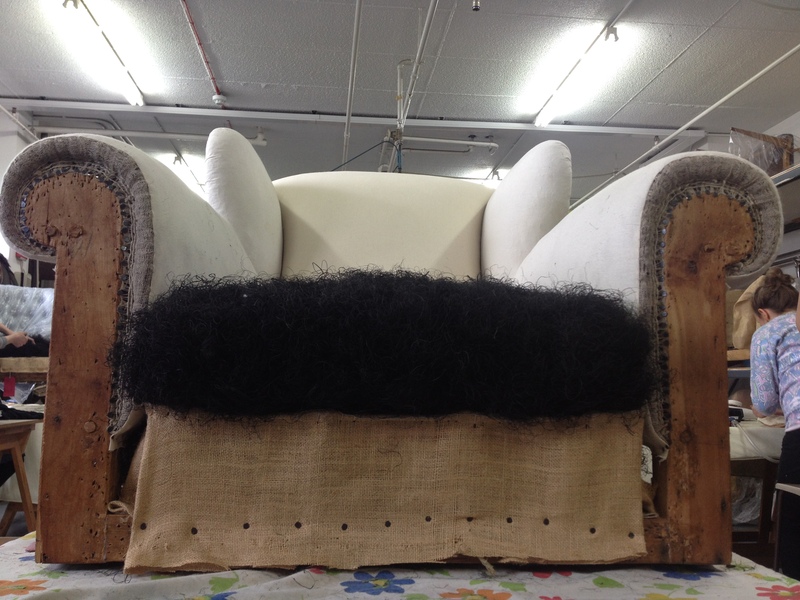 The owner was moving back to Vancouver Island and wanted to have the chair reupholstered before she left. She loved the hessian and webs exposed at the back and wanted to try and retain as much of its character and history as possible. 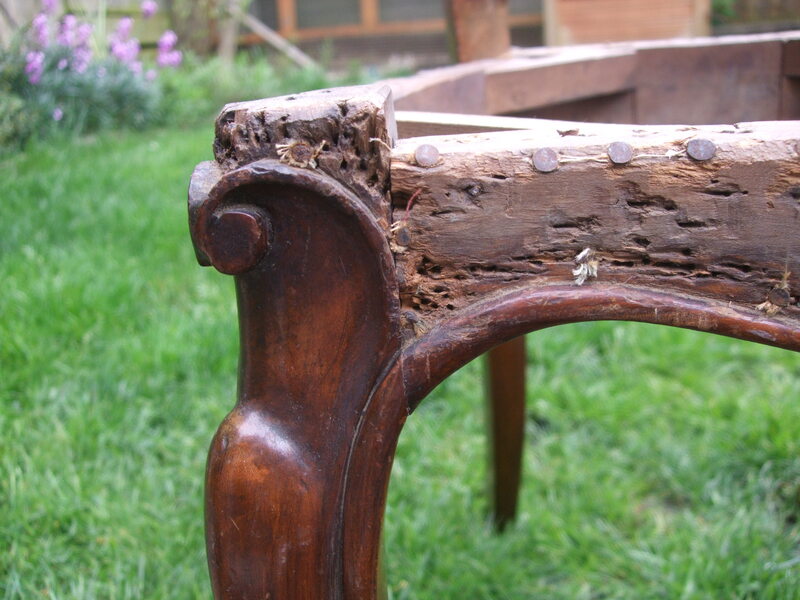 The frame had some woodworm which was quickly treated and its cover was a beautiful raw silk that was very frayed. When I took off the cover you could see the original colour of the silk where it had been tucked inside the frame and had not been faded by exposure to sunlight. 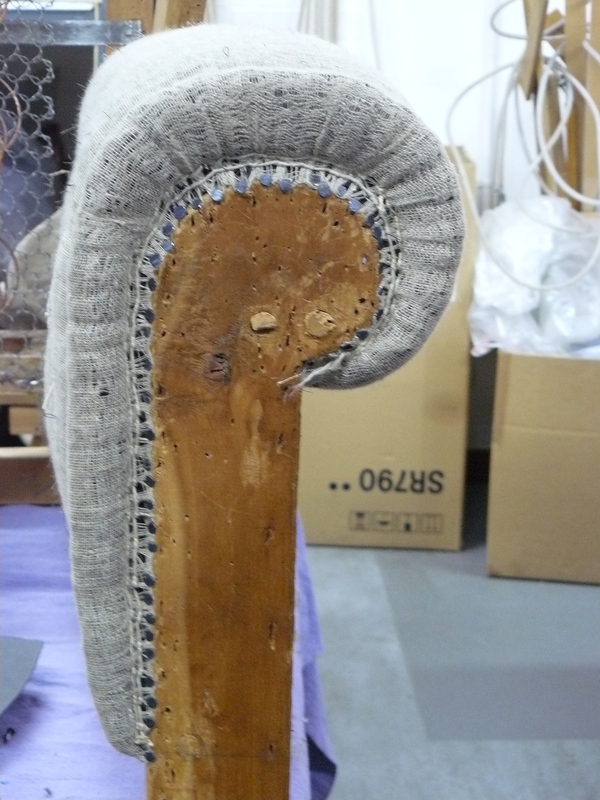 You could also see the threads of the raw silk… Beautiful! 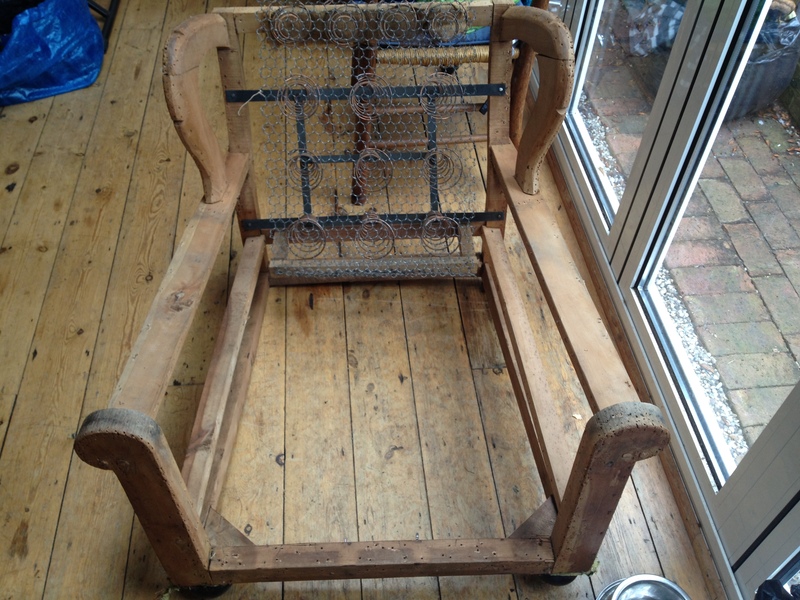 The back upholstery was in fairly good nick so I just rebuilt the seat. 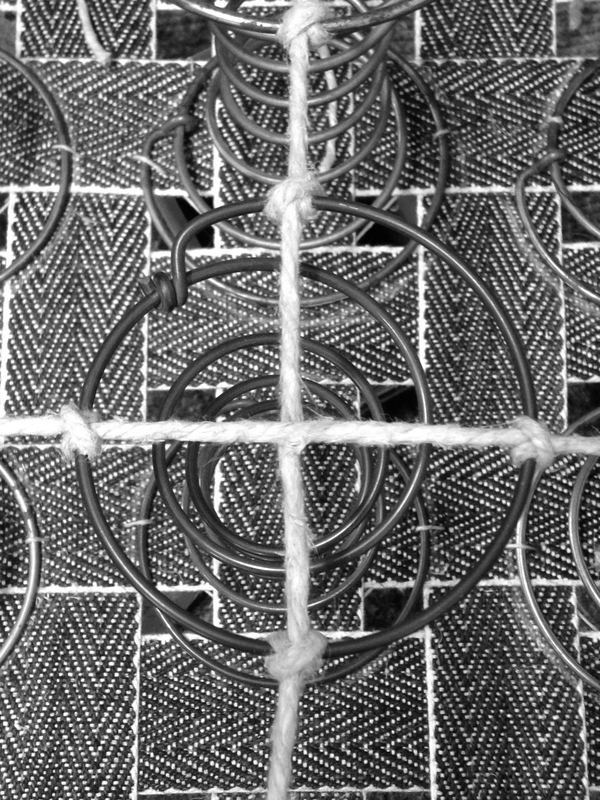 These were the beautiful old Victorian springs inside which were a bit too distorted to reuse. I’ve kept them though as you know I’m partial to spring and these are beauties. The back was left open so that the lovely webbing and hessian could be seen – all framed with deep pink velvet and piping. I chose a piece of the brightly coloured original silk to secure to the outside back. 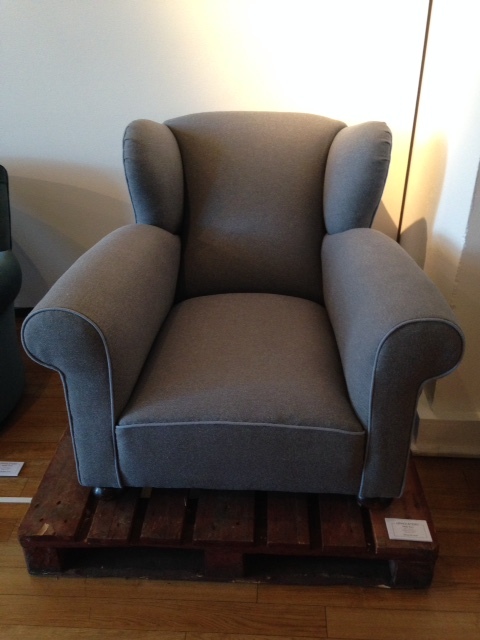 I like to think of this chair eventually sitting in its new home in Vancouver Island. I’m quite jealous really – lucky chair! 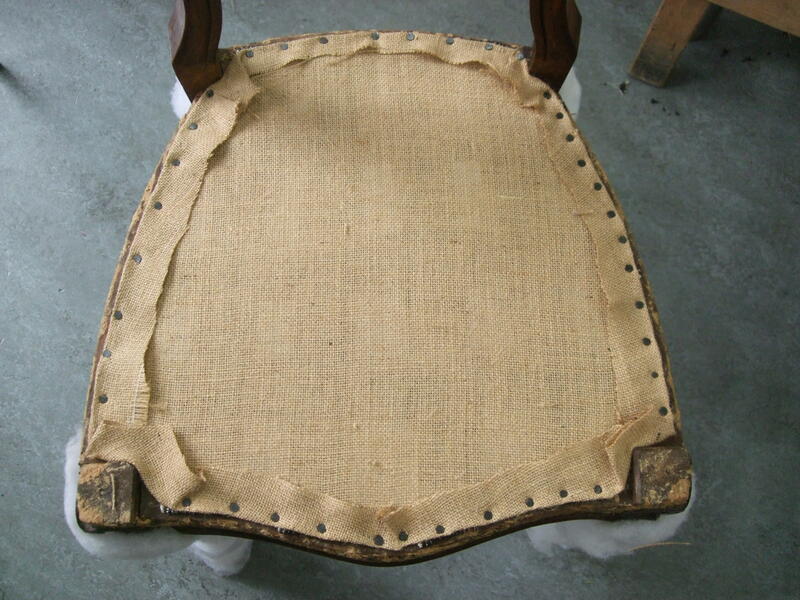 Posted in furniture, upholstery and tagged Brighton, hessian, rawsilk, springs, Traditional upholstery, upholstery, Vancouver Island, velvet, victorian nursing chair, webbing on 09/09/2017 by Spring Upholstery. 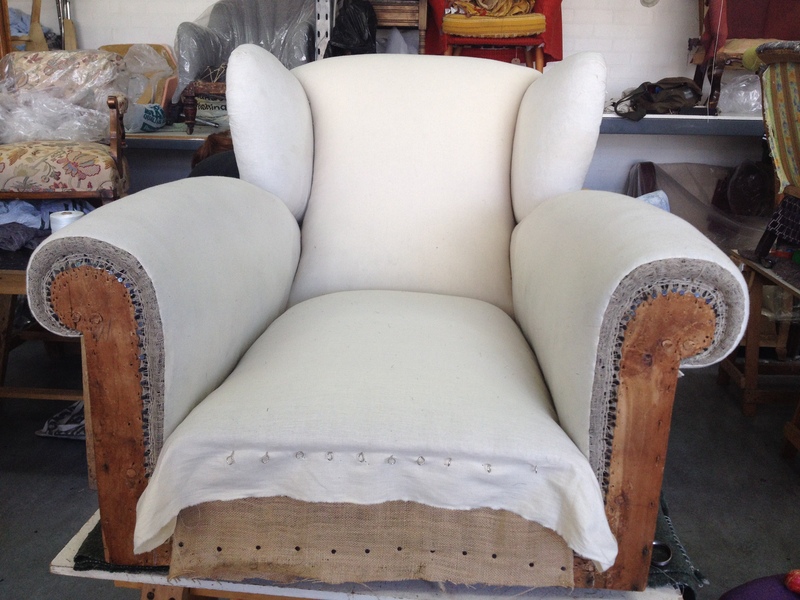 Traditional upholstery is about so much more than the fabric that covers a chair. 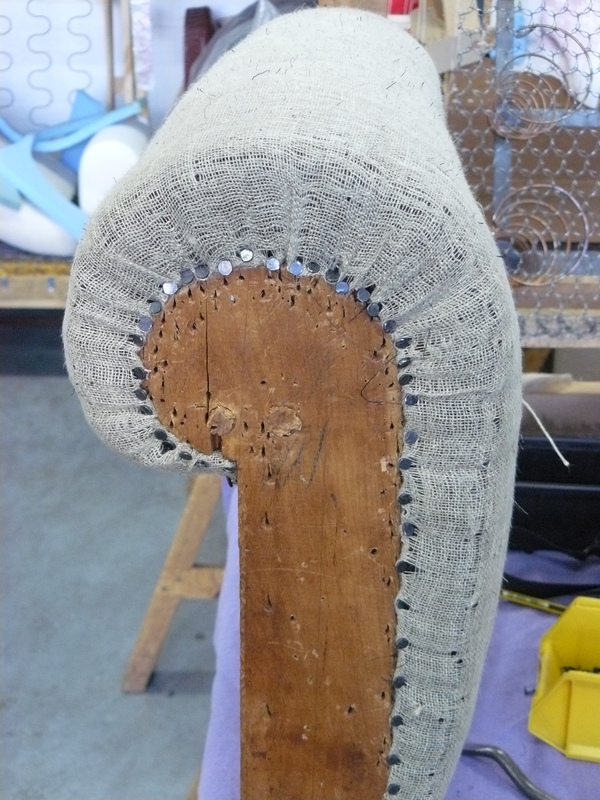 Underneath the surface there is layer upon layer of work to create, build and sustain the shape of the chair. 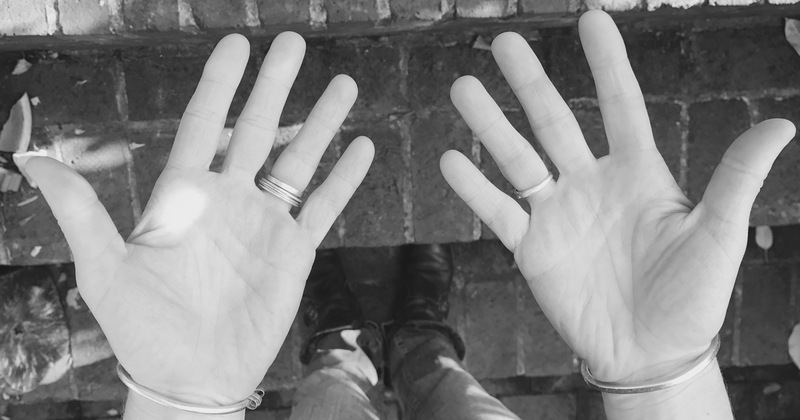 All achieved mainly using these and a few simple tools… I know, I’d never make a hand model! This is going to be a buttoned back – which is why the edges are being built up first to create a well for the buttons… Rest in peace Princess Leia. Sustainability The materials used in this chair are all natural and biodegradable, apart from the metal springs and they can be recycled. 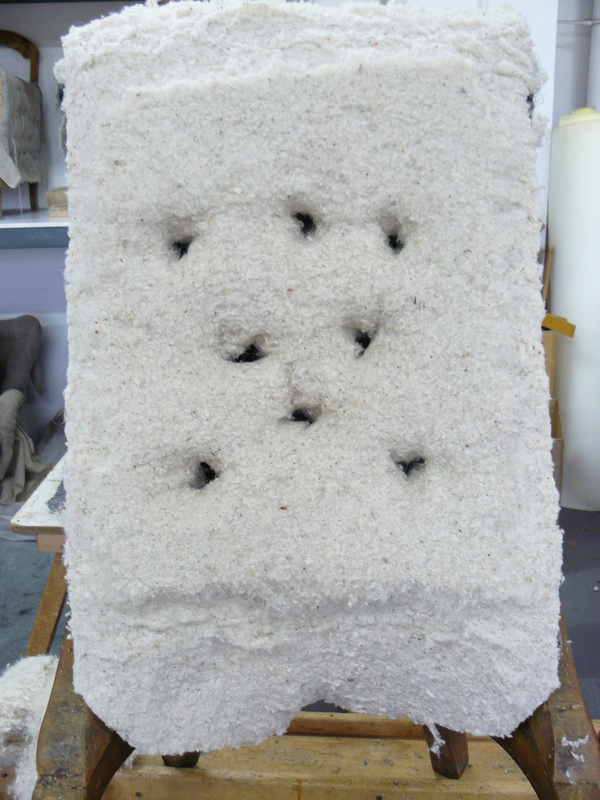 Foam is an oil-based product and will sit in land fill for hundreds of years. 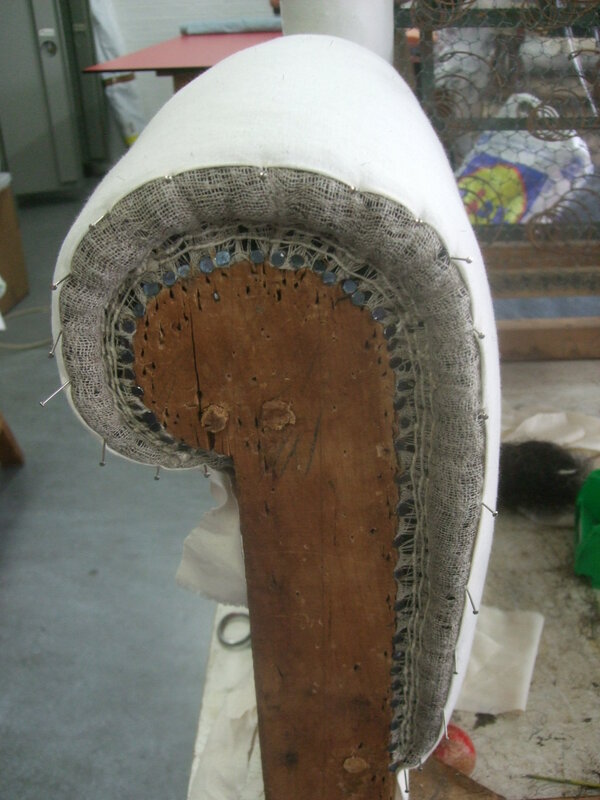 Longevity A chair built with traditional materials and methods will last a long, long time, literally decades beyond the life of a modern piece of furniture made with foam. 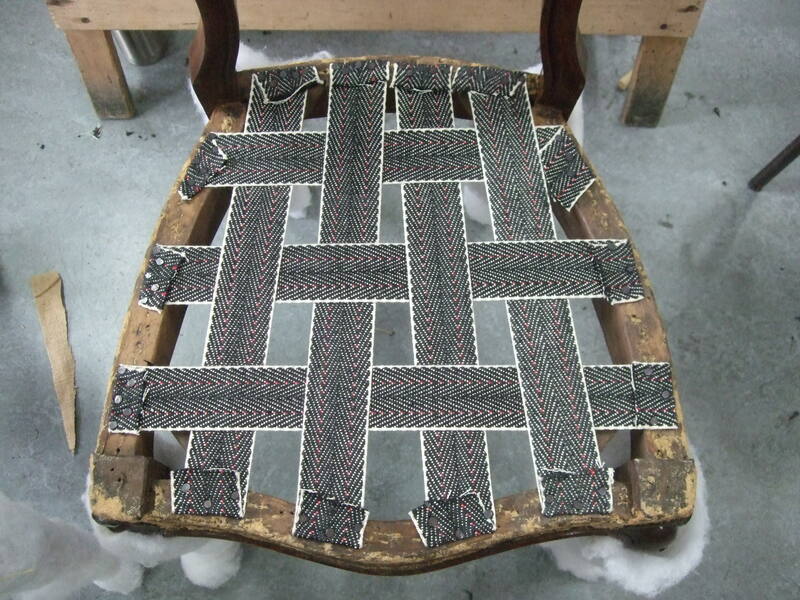 Tradition This is how these antique chairs would have been upholstered over 100 years ago. 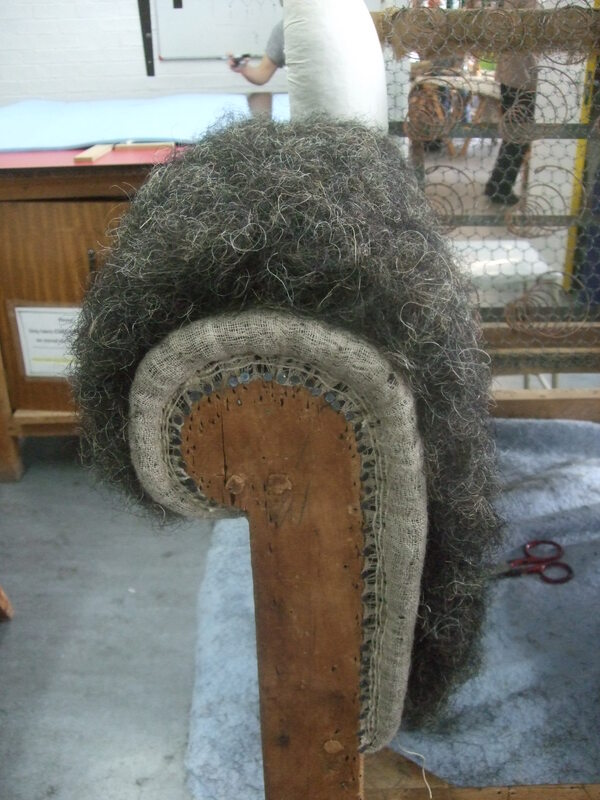 To retain the integrity and authenticity of an antique piece of furniture its important to use methods and materials in keeping with its origins. 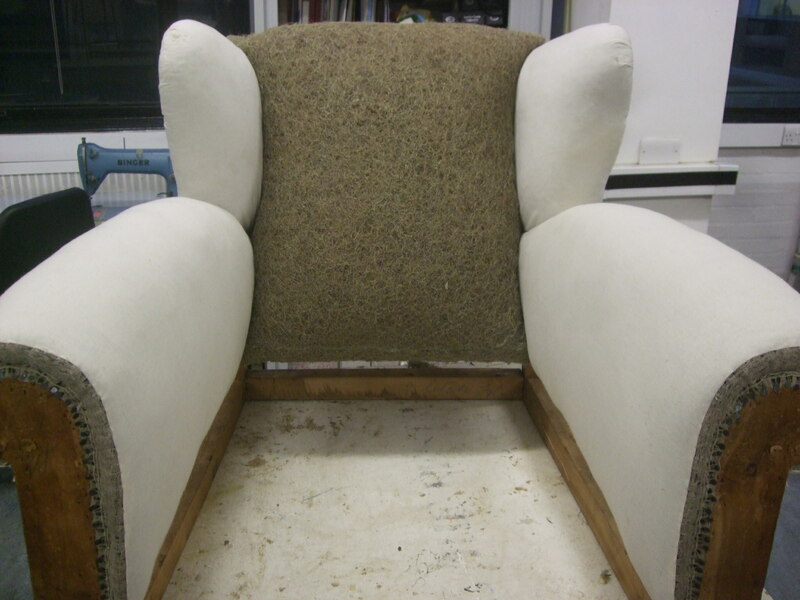 Posted in upholstery and tagged Brighton, chair, deep buttoning, independent sprung edge, madeitwithmyhands, NickiTarr, springupholstery, sprung seat, stitched arms, Traditional upholstery, upholstery, Victorian on 01/12/2016 by Spring Upholstery. 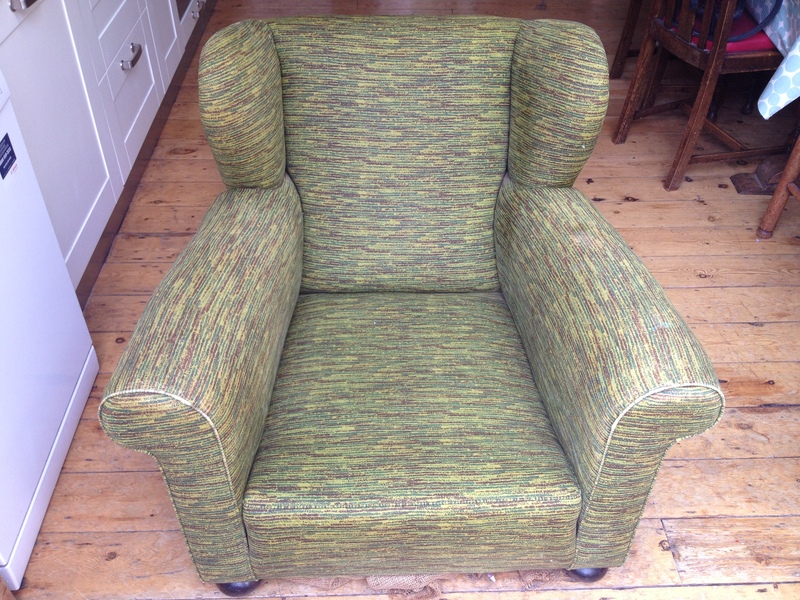 A few years ago some friends offered me a lovely old arm chair – it’s a 1930’s club chair that had been in Sarah’s family for years, she had been nursed on it as a baby and grown up with the chair in her family home. Here it is in the 1980’s with some William Morris fabric, a skirt and a very sweet dog. Oh and this is Sarah on her horse. In more recent years, it spent some time in Sarah’s own living room with a new loose cover (made on the other side of the world but that’s another story). 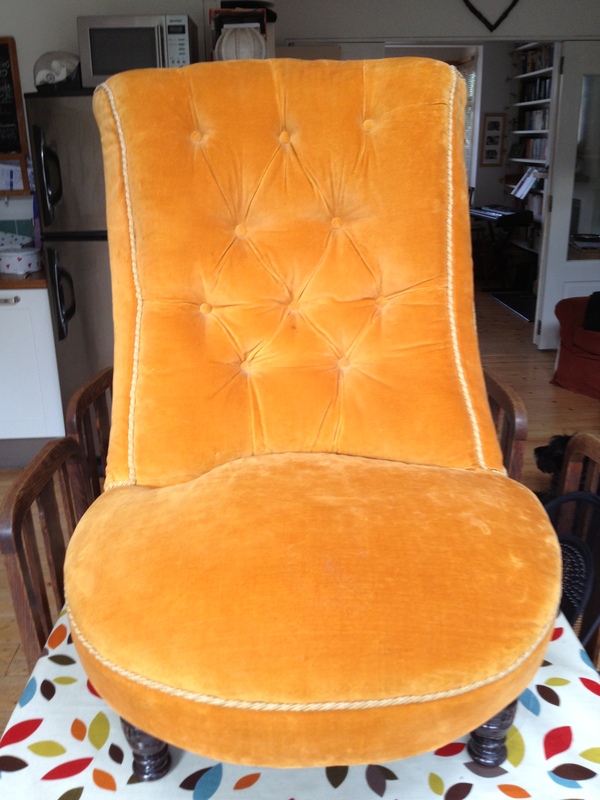 Really it needed reupholstering but this is a huge chair and it was going to be expensive! Knowing about my career change, Sarah gave it to me as a future project. It is a beast of a thing, but I love it! It took two of us to lift it and we could barely get in through the front door and into the hall. 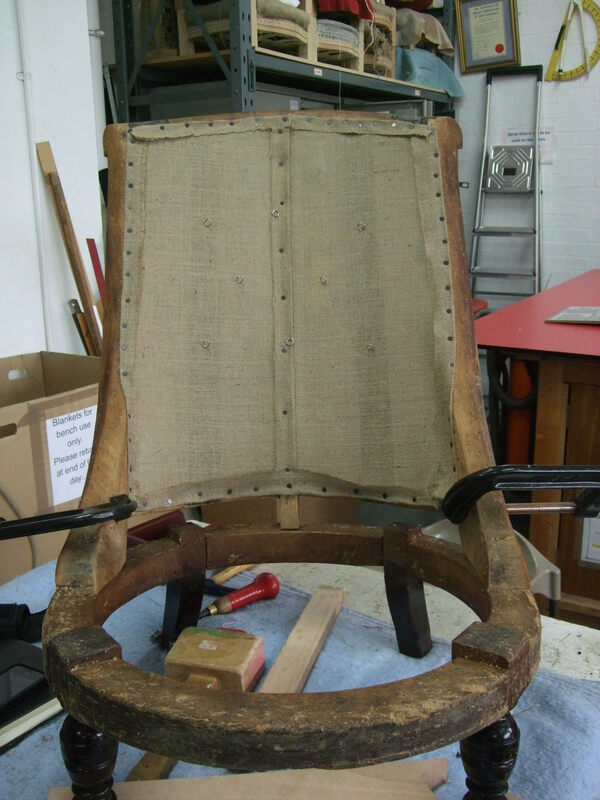 Here’s what it looked like under the loose cover and stripped back to the frame..
Actually they do and then they put her on a pallet at The Cass Upholstery end of year show 2015. 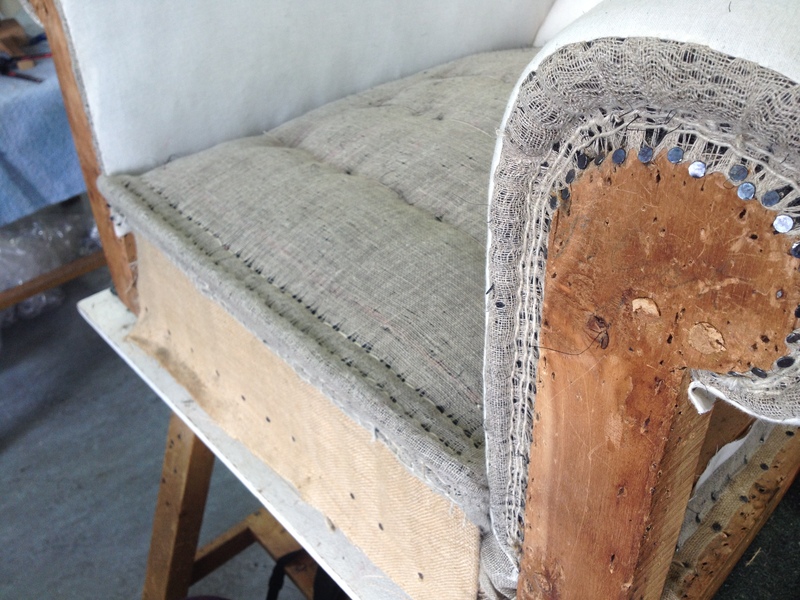 Learning the noble art of traditional upholstery continues to be both hugely challenging and incredibly rewarding. 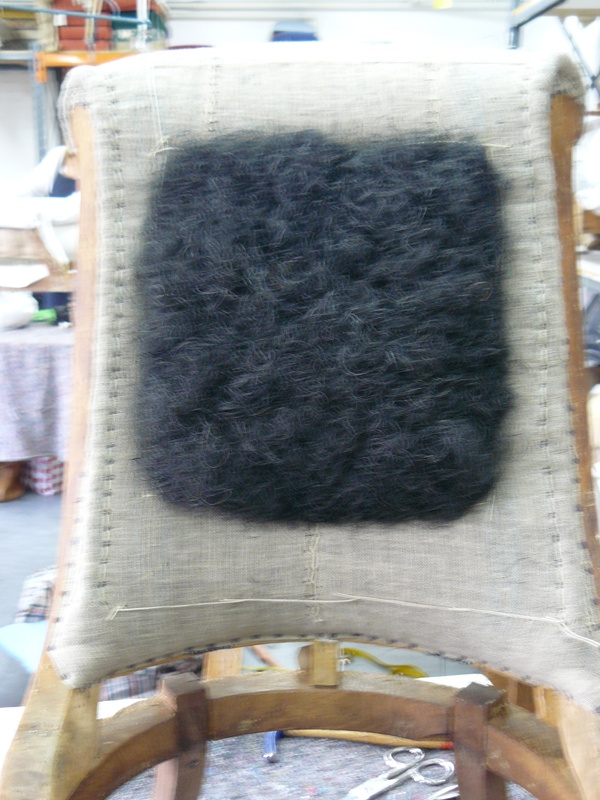 However, it turns out that creating a number of matching chairs is a whole different skill in itself! 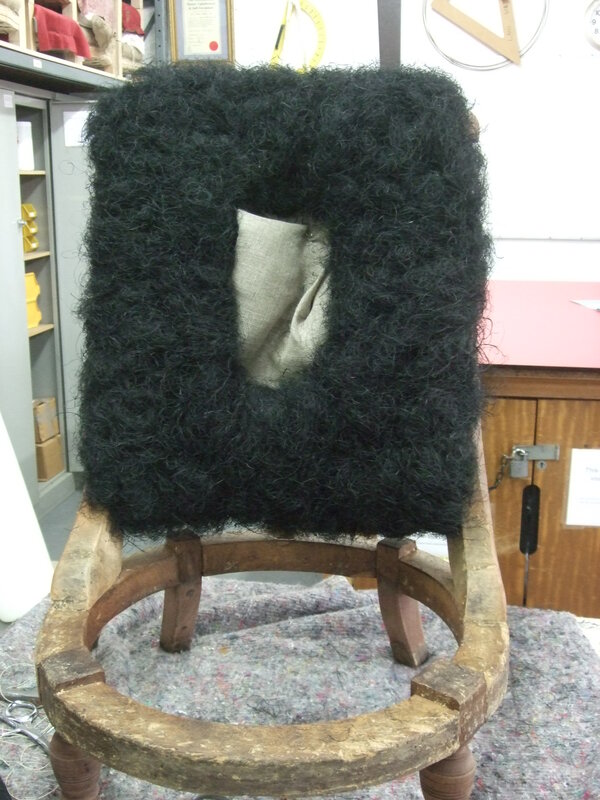 So back in the summer, I brought two dining chairs into college to work on together. 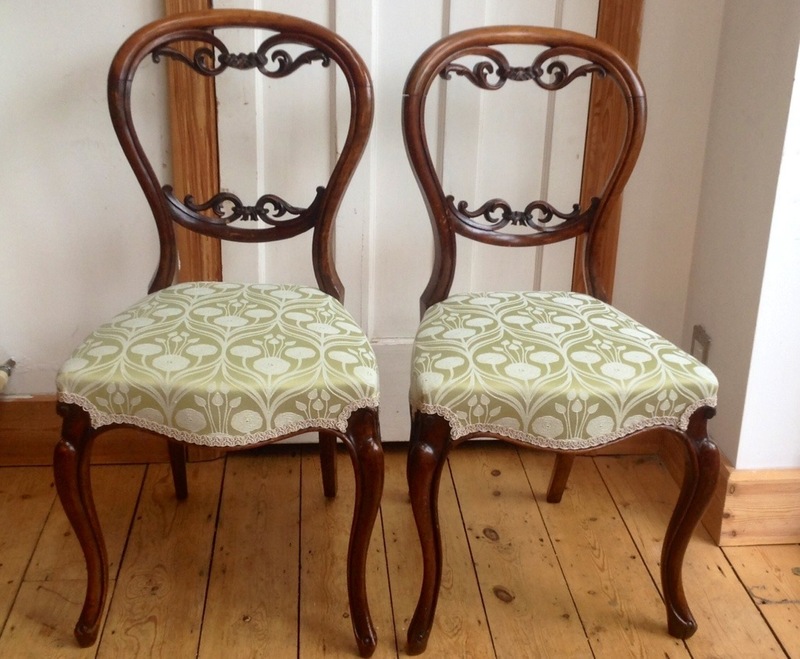 These chairs are Victorian balloon backs with cabriole legs and some beautiful carving. 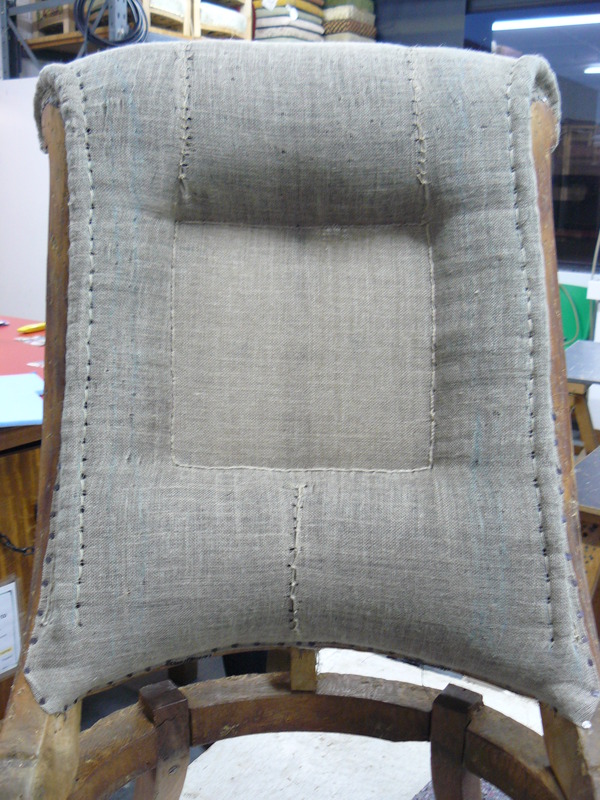 This style of chair dates from about 1840, so they are approximately 150 years old. 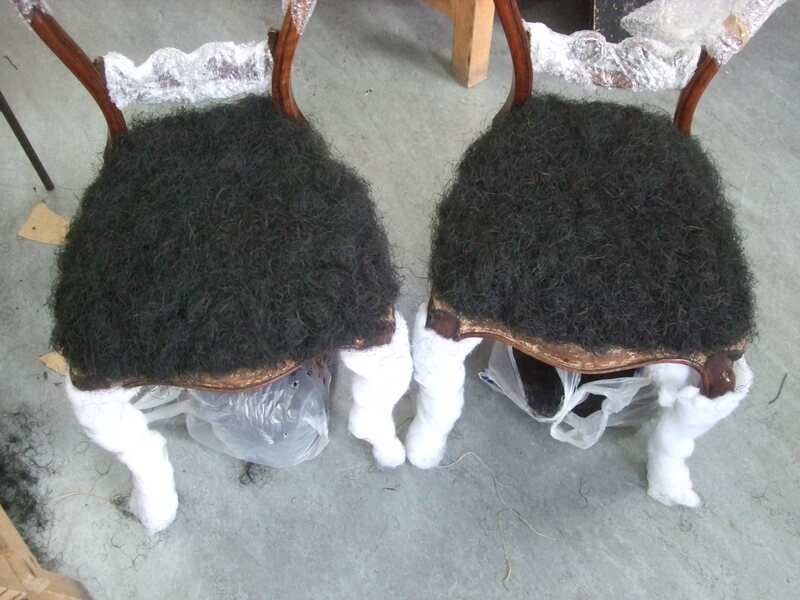 In order to create two matching seats, you have to apply each layer of upholstery to both the chair frames, weighing the stuffing and constantly measuring the height as you go. 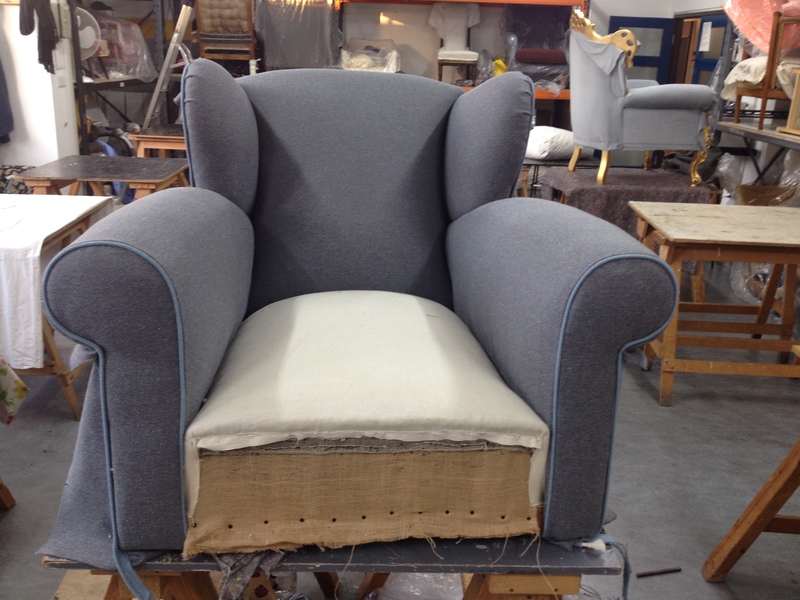 Stitching is one of my favourite elements of traditional upholstery – it creates a firm edge, gives a seat its shape – and its key to creating two seats that look the same! 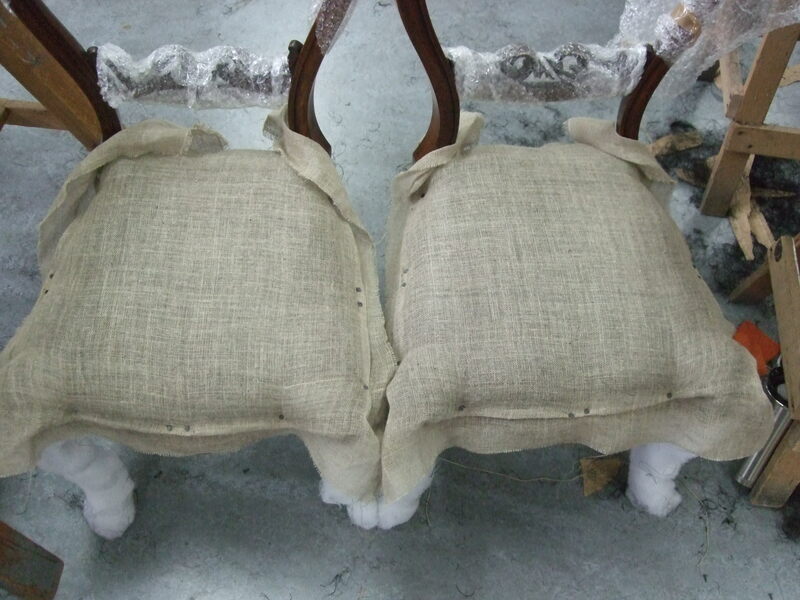 Using traditional upholstery methods and materials on these antique chairs means that they not only look beautiful, but will now have many, many more years of life in them yet. And they look pretty darn matching too! 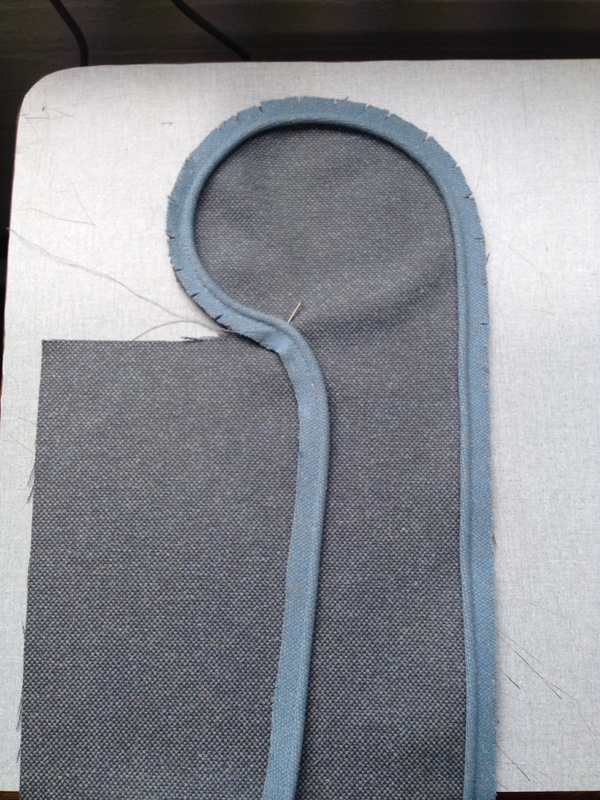 Deep buttoning is a rather curious thing…. 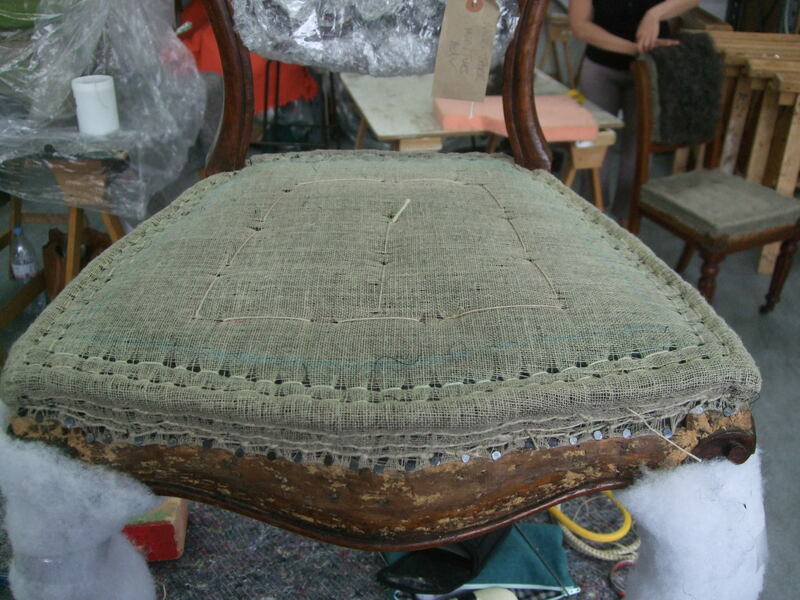 Victorians introduced it in the second half of the eighteenth century to give ‘fresh decorative character to upholstery’ (David James 2008). 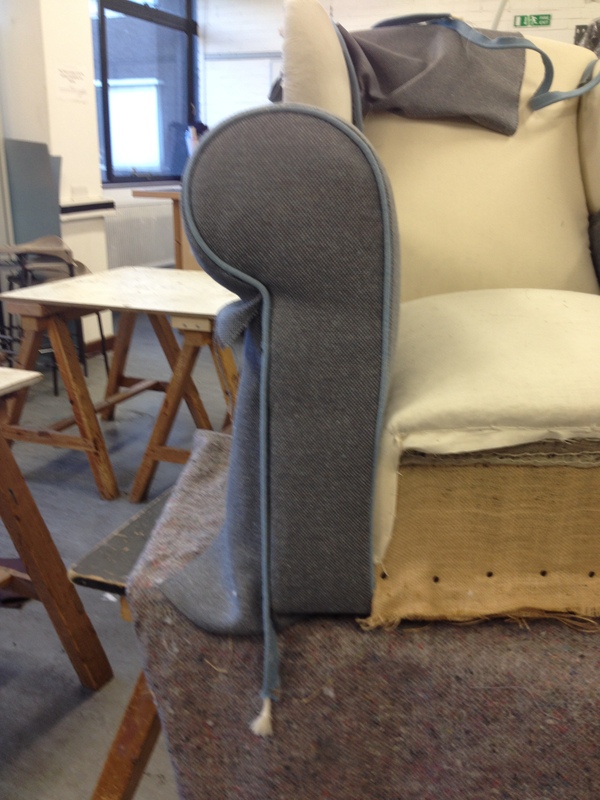 Actually – they came up with it to torture upholstery students… Traditional deep buttoning is very difficult! 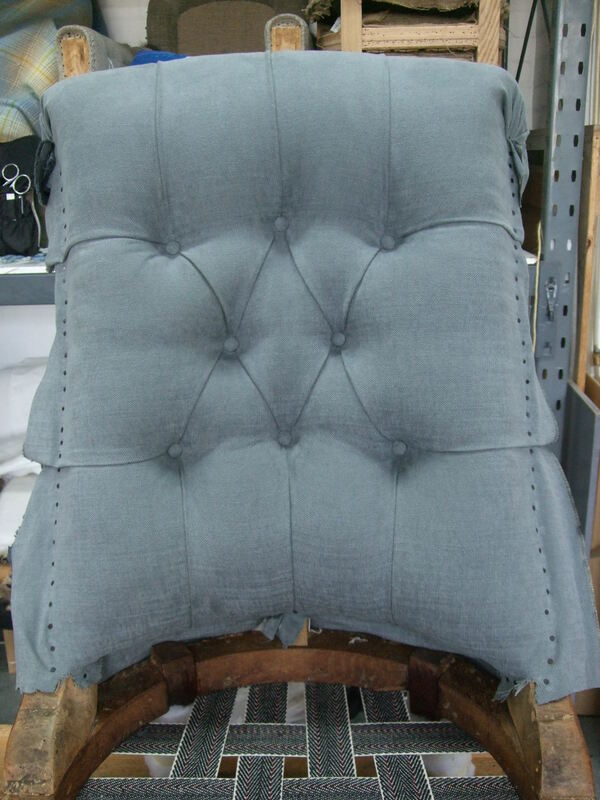 After many, many hours and a lot of effort – this was the end result… A very comfortable, deep buttoned Victorian slipper chair. I decided to name my fledgling business – not after the season of daffodils, baby lambs and cherry blossom – but actually after the humble metal spring. 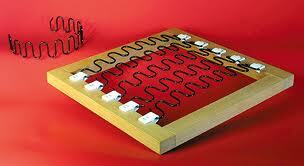 Springs are marvelously utilitarian in their look and feel and yet still manage to be beautiful. They create the foundations of a seat and contribute to it’s comfort and stability. Before springs – you’d have just sat on fillings like hair, feathers or rags – with not a lot of give! 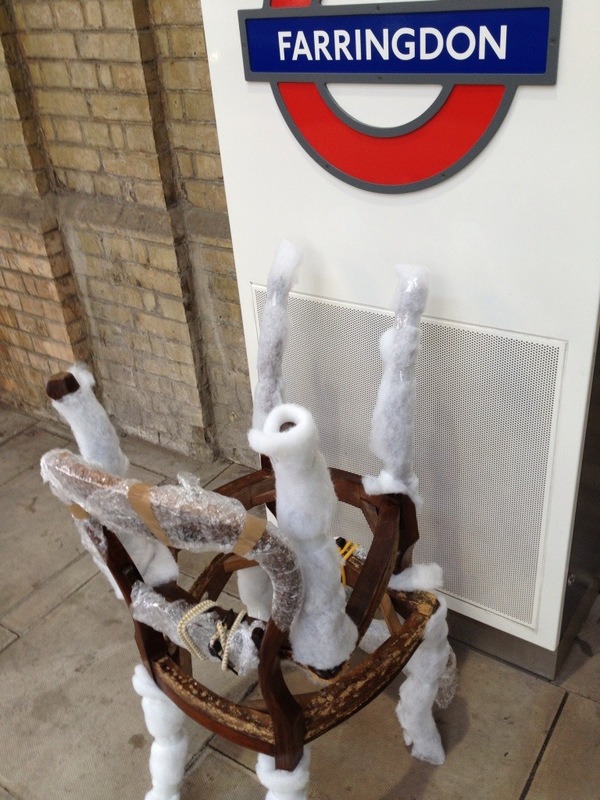 The Victorians introduced the double cone spring and by 1850, many seats, backs and arms were being built with these springs to provide comfort. 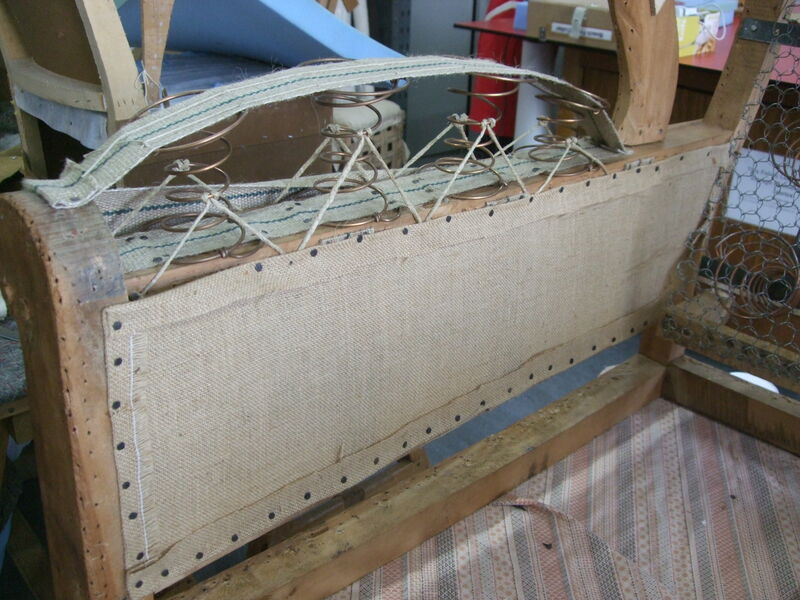 These springs look very similar today and are still used in traditional upholstery. These are my favourite. Beautiful! The first half of the 20 century saw lots of development to the spring – mainly to increase speed of making mass produced furniture and reduce costs. For example you didn’t need to know how to position and lash springs when inserting a spring unit – just pop it in! 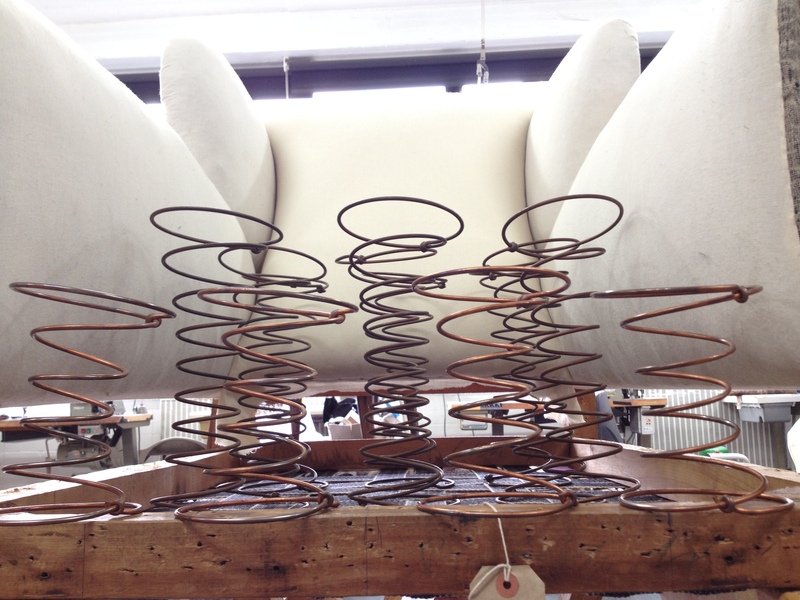 Tension springs are often seen in 50’s & 60’s furniture and were used a lot in Parker Knoll chairs. Serpentine springs are the sorts of springs used in a lot of modern furniture – you’ve probably got some inside your sofa! 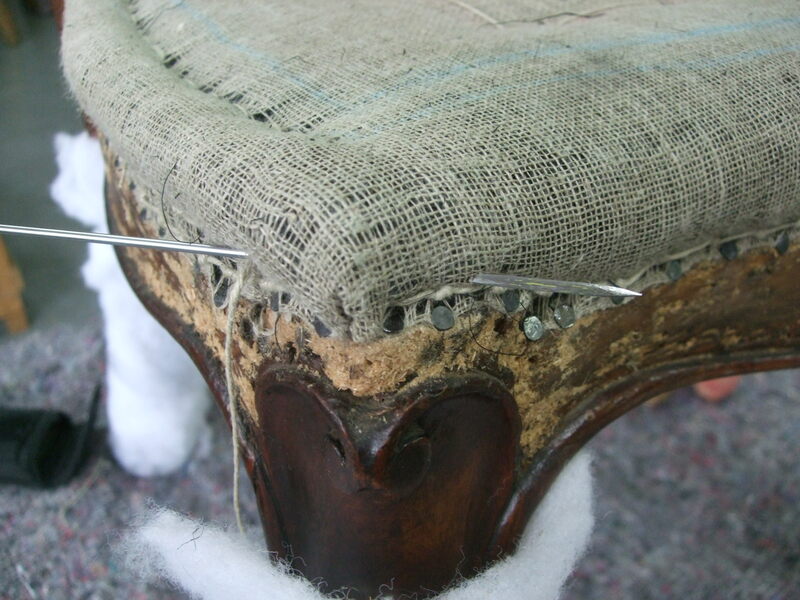 So next time you drop into a comfy armchair – give a thought to the springs hard at work beneath your derriere!